Sadly I have a reaction to Batiste Dry Shampoo it does an amazing job but makes my scalp red and itchy. I then started searching for a Dry Shampoo that did a good job and I didn't have a reaction to! The first one I tried was a Tresemme Dry Shampoo, which made my hair kind of wet and look more oily. I tried to make it work a few times but it just didn't do the job! 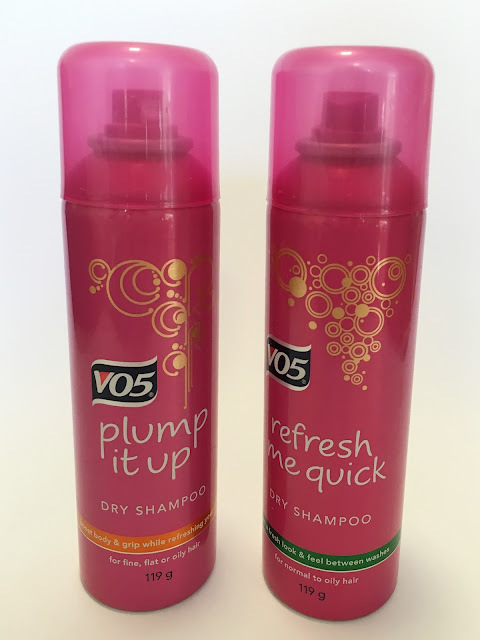 Then I tried V05 Dry Shampoo, I tried the refresh me quick and plump it up version. They are both pretty similar in my opinion but both do an amazing job! They smell great and are very easy to use. Neither of them leave a white powder in your hair. They blend well and lasts all day. Dry shampoo is meant to give you an extra day so you don't have to wash your hair. Sometimes I have extremely lazy hair weeks and use dry shampoo 3 days in a row (embarrassing and gross I know) but it doesn't build up and become really disgusting. The V05 Dry Shampoo is working great at the moment when I run out of these I will test other Dry Shampoos to see if there is anything more suitable out there!! I will keep you updated! !